Once you have a base or customized UINavigationController loaded via XIB, you might want to load a custom UIViewController into that Navigation Controller. This is actually very simple. First write a custom UIViewController via the normal Objective-C derivation process. I am not going into that detail. 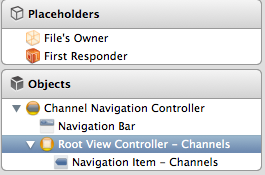 Let's say, you call it, RootViewController. 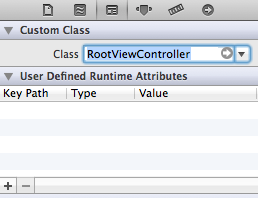 Now, in the Identity inspector, set the class to RootViewController. See below. That's it. Now if you build and run, iOS automatically creates an instance of your customized RootViewController class and load it up in the Navigation Controller.